The Sisyphus Painter is only known by this conventional name, as his true name remains unknown. He is one of the most influential painters in the Apulian vase painting tradition, and thus in all South Italian vase painting. His conventional name is derived from the inscription on the heart-shaped gift held by a youth as part of the depiction of a wedding on one of his volute kraters. He follows the tradition of the Painter of the Berlin Dancing Girl in whose workshop he is assumed to have started. Arthur Dale Trendall described the Sisyphus Painter as "probably the dominant artist of the Taras School". Nonetheless, the quality of his works is uneven. Especially on larger vases he showed his quality as a painter of heads, often depicted in a three-quarter profile. 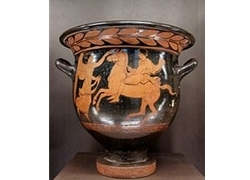 His early work includes a variety of bell kraters, usually decorated with three figures. He mainly painted scenes of everyday life or dionysiac scenes. On the backs he always painted two or three cloaked youths. Towards the later phase of his activity, the quality of his work deteriorated, many of his late paintings appear very stereotypical, thr facs rounder, their features coarser. His range of subjects also turns less and less imaginative, limited almost entirely to youths, warriors and women.